Would you Like to Fall under a Garden Spell With Us? 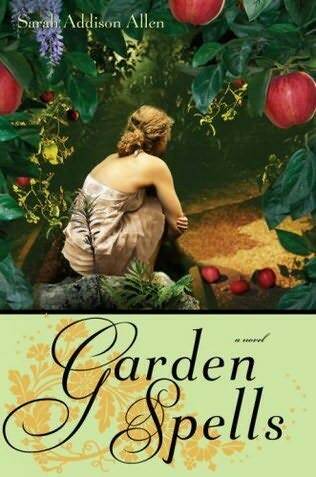 It is time for a new book selection for our foodie book club and as the host for this round of Cook the Books, I have picked Sarah Addison Allen’s debut novel “Garden Spells” for our June/July reading. Ms. Allen has gone on to write a number of other bestselling novels, including “The Peach Keeper”, “The Sugar Queen” and “the Girl Who Chased the Moon”. You can find out more about these books and investigate some recipes from main character Claire’s personal cookbook on Allen’s website. On the recommendation of Cook the Books regular (and two time CTB winner) Heather, the Girlichef, I picked up a copy of this enchanting novel and found the combination of eccentric characters, garden and cooking themes, and a compelling story line to be irresistible. I wanted to reread the book soon and try my own hand at some of the wonderful dishes Claire the caterer whips up out of her kitchen and garden. I also thought this book would give us a chance to investigate North Carolina style cuisine and let us fall to the siren song of summery, garden-fresh ingredients and inspire us to create magic in the kitchen. Ms. Allen is unable to serve as our guest judge, but I am pleased to announce that Jenna of the blog Literature and a Lens will be judging our posts and picking a winner to receive the coveted Cook the Books Winner’s badge for their blog. You can read Jenna’s perceptive review of “Garden Spells” on her blog and see some of her other recommended reading. The deadline for submitting a post for the Cook the Books roundup is Monday, July 25, 2011, midnight Eastern Standard Time. Please leave a comment below to let me know that your post is up or send me an email at: oldsaratogabooks [at] gmail dot [com]. Remember, anyone can join in our roundup of posts. All you need to do is buy or borrow a copy of this book and then blog up your thoughts about it and a dish inspired by your reading to share with us. Not an easy choice… I loved reading the different takes on the book – and the tales shared. Shelling walnuts for walnut oil in Kaye’s Kitchen, and just enough time to do something nice for yourself, like the mint tea in Eliot’s Eats. Thank you all so much for participating. The club is terrific idea for the culinary-minded reader (I’m going to post a link on my facebook page), and all the posts were a pleasure to read. PS – Thank you again to Maria of Organically Cooked for suggesting the book. We are heading back to Crete this summer, and she and I are destined to meet for lunch one of these days! So congratulations Rachel and Hethaer , and thank you Elizabeth for a lovely book and for judging. See you all next month with “Garden Spells”.